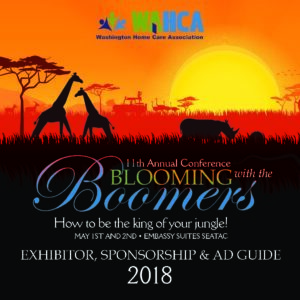 The Washington Home Care Association is excited to be putting on our 11th Annual Statewide Conference: Blooming with the Boomers! Clinical strategies for caring for adults with Dementia, Parkinson’s, Alzheimer’s, Med Management, Fall prevention, etc. If you would like to speak to our association, please submit a proposal no later than 2/28/2018. Please let me know if you have questions. If interested in exhibiting, sponsoring, or advertising at this year’s conference, please click HERE to learn more. ← Local American Lung Association Better Breathers Support Club!